The seismograph stations operated by UQ have two modes of recording ground motion: continuous mode and triggered mode. In continuous mode, the stations record the vertical movement of the ground continuously. Continuous data is displayed as a Heliplot showing the ground motion for an entire day on one graph. In triggered mode, the stations only record ground motion when the seismograph detects a signal that is significantly larger than the small ground vibrations that occur all the time. Once triggered, the seismograph records motion in three directions: North-South, East-West and Vertical. The triggered data is then sent to UQ where it is stored in the Seismogram Database. Continuous and triggered seismograms may be viewed online, within a few minutes of being recorded. Each week a Seismologist analyses all of the triggered seismograms and determines the type of event recorded in the seismogram. The event classifications are stored in the triggered event database. This information is used to automatically generate Event Statistics, including the number of event triggers recorded by each station and the number of events of each type. Trigger records also contain information about the State-Of-Health of the seismograph at the time of the triggered event. This information includes the battery voltage, supply current, and temperature of the seismograph. This diagnostic information is vital for monitoring the State-Of-Health of the seismograph network. 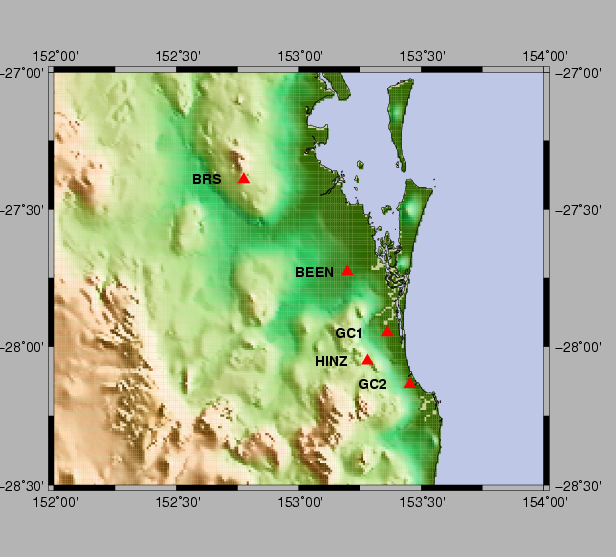 Locations of the seismographs operated by UQ.